JOHN BERMAN: Let's bring in someone who knows how this process works or is supposed to work, Donald Trump's former campaign manager, Corey Lewandowski. Corey, we should note is still receiving severance from the Trump campaign. COREY LEWANDOWSKI: Someone at the senior levels of this campaign has reviewed what Melania Trump was going to say and signed off on that. Now whether they're held responsible, because the buck stops at the top, or the person who actually put those words to paper is held responsible, I think it's shameful that Melania Trump, who is such a great person, who represents her husband and would represent this country amazingly as a first lady is under this controversy because the staff didn't do her well. BERMAN: So you called it a mistake. You think someone needs to be held accountable.That's not what the campaign is saying so far today. We just heard Paul Manafort who essentially said "nothing to see here, this is what you get when you attack Hillary Clinton." To be clear, Corey, you're saying something completely different. You're saying there was a big mistake, and someone should be fired. LEWANDOWSKI: What I'm saying is, if what is being reported is accurate -- that 23 of the 26 words in two paragraphs were exactly the same as Michelle Obama -- the staff should have seen that. KATE BOLDUAN: Corey, you mentioned something, you said someone on the staff level is responsible for this. You also said you don't know -- it could go all the way to the top. All the way to the top would be Paul Manafort who has been out there saying there's no way this was plagiarized. Do you think the buck stops with Paul Manafort on this? 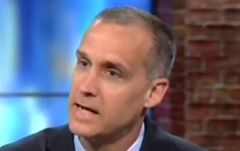 LEWANDOWSKI: Well I can tell you when I was the campaign manager, the buck stopped with me, and I'm sitting here with CNN now. So the buck stops somewhere at the top. And what I think is, at the end of the day, when you're the convention manager, you're in charge of the convention. And so there is no detail too small, particularly when you are looking at and scrutinizing the GOP nominee's wife to give the largest speech in front of 35 million people, there is no detail that you should overlook. BERMAN: Paul Manafort you're saying bears some responsibility for this? LEWANDOWSKI: I think someone at the staff level does. And I think Paul is at the top of that and he should find out who is ultimately responsible for putting that information in and allowing that to go forward and hold that person accountable. LEWANDOWSKI: Whoever signed off, with the final signoff and allowed this to go forward, should be held accountable. BERMAN: And if it was Paul Manafort, he should be held accountable? LEWANDOWSKI: I think if it was Paul Manafort, he'd do the right thing and resign.